OK, so why get an electric skateboard? We simply because they are awesome! Most people buy a standard skateboard and do crazy stunts, and push themselves to new limits. Those are the common scenes you may have seen at the skateboard park or on YouTube. The electric skateboard is different. You don’t do that stuff on these units. Let me go in to some detail about these boards. Basically, they are longboards, and NOT skateboards. Longboards are desinged for speed and stability over speed. Skateboards are much shorter and more manoverable than longboards hence their ability to perform well at stunt riding. The longboard has been around for years and is popular with people that want a basic form of trasportation that gets them from A to B in a relative short time and to definitely beat the commuting rush hour. Well with this in mind, it makes total sense to tighten our belts and power up a longboard, and that is what a number of manufacturers have done with varying successes. Now I have to say that my roots have been on the longboard, and when the electrified version came out, I had to try it…….. Guess what…… I did, and so too did my buddies, and we were hooked! This is now our passion, on the electric longboard, going at speeds that will blow your mind. We hangout and travel too and fro on our electric longboards. Yeah, we get funny looks from folkes we are leaving for dust in the stand still traffic, but it’s because they are not used to seeing it I guess, or they are just jealous cos they are stuck in a road jam. We have been through a few boards over the years, so are familiar with what’s cool and what to avoid. 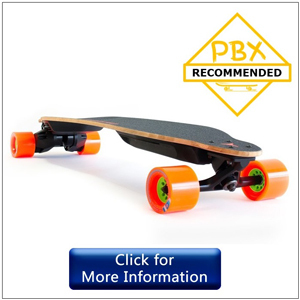 The reviews below are based on what we see are the top 4 electric skateboards on the market for the specific user. Now I am not saying these are the top 4 electric longboards, but rather, they are the best 4 boards in their category. Some people buy on price, and so end up with a board that doesn’t perform as the top end. Others however, don’t have a budget and go for the most expensive board on the market. We have advice on this below. Others however will look for an electric longboard that fits their budget but still performs. We also have our best advice on this too below. With a rating of 4.6 out of 5 stars on Amazon, Boosted’s 2nd Generation Dual + Electric skateboard is an overwhelming hit among users. In fact, 83% of buyers even gave this board 5 stars. 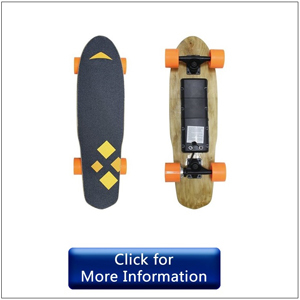 Advertised as the most powerful electric skateboard in the market, and also our recommended electric longboard. This is a beast of a board, and let me tell you that there is nothing else on the planet that even comes close to providing top specification, features and a ride that is second to none. 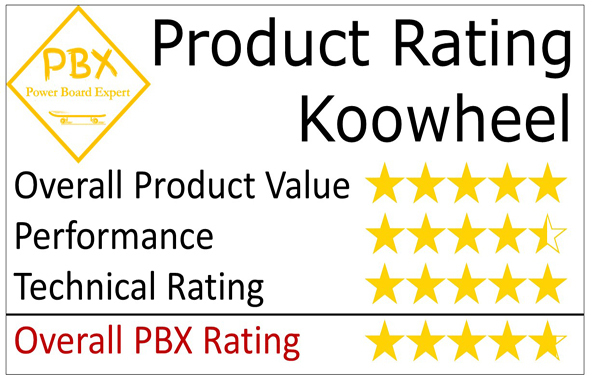 This unit wins our PBX Recommended award by a mile!!! Although the components on this unit are heavier than on other boards, the unit only weighs 15 pounds (or 6.8 kgs). This is because the deck is made of bamboo and fiberglass while the tires are made of polyurethane. So the board’s components are heavy because of high specification and power, but the deck being made of bamboo and fiberglass has compensated, and the board is actually lighter than most. The deck is amazingly durable and robust. The construction means it is going to last and you have to take that in to consideration when buying an electric skateboard. After all, these units aren’t cheap, so it is better value to spend more money on a model that is going to last than going for the cheap option and getting one that falls apart. This Boosted unit is 38 inches long, 11 inches wide and 5.75 inches high. The tires have a diameter of 3.14 inches. The powerful motor has an output of 2000 Watts, allowing you to reach the maximum speed of 22 mph. 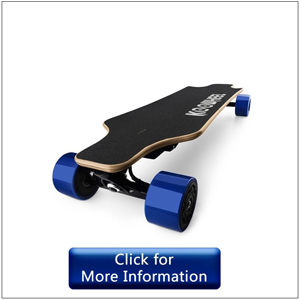 The board has its own speed controller that reduces your speed when it’s near the maximum. The decrease is done slowly so it doesn’t throw you off the board. It is powered by the built-in battery, rated at 99 Watts. It has a significantly shorter charging time than other models, taking only one hour to achieve a full charge. The maximum range is 7 miles, though an upcoming battery update will allow you to reach 12 to 14 miles. This extended range battery may be purchased online, but current buyers may receive a coupon to purchase it. Unlike other skateboards that are made with layers of wood, Boosted’s 2nd generation skateboard is better and more flexible and is also easier to turn and generally maneuver. 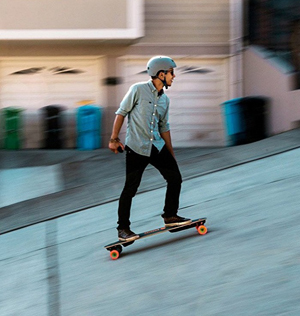 The Boosted board has an impressive ability to cope with hill and inclines and in tests using a rider weighing 170-lb, the board performed effortlessly on a 25% incline, despite the weight. Deck Construction: Bamboo and Fiberglass. Motor Specification: Dual 2000 Watts. Weight: 15 pounds (6.8 kgs). Dimensions: 5.75 x 11 x 38 inches. The wheels are 3.14 inches. The maximum speed is 22 mph and the maximum range of use is 7 miles. Product warranty is up to 6 months. 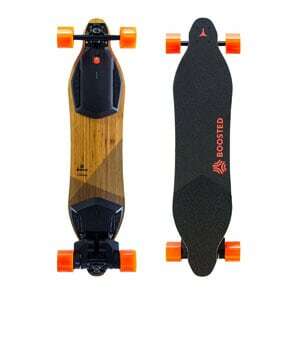 The Boosted 2nd Generation electric longboard may have a hefty price tag, but it’s NOT expensive for what you get. For the money, you get a Ferrari of the boards. 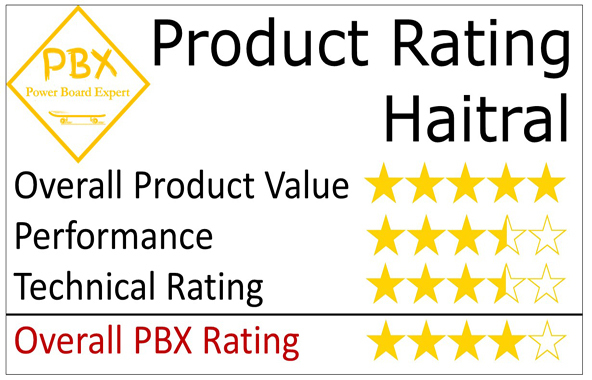 All the others are general saloons in comparison and is easily our PBX Recommended product. There is no doubt that you will have more fun on this model than any other. It goes faster and is a way more enjoyable ride. This is feature rich, and offers exceptional value, even though it is more than 2 or 3 times the price of other boards. Our advice is… If you can afford it, go for it. If however, you want this level of performance at a lower cost, then I would advise that you go for the Koowheel electric skateboard. It is not in the same league as far as quality of build goes, but is probably our 2nd most favorite model. 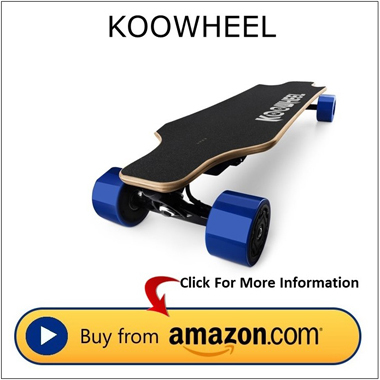 There’s no doubt about it, the Koowheel board has an exceptionally high specification. 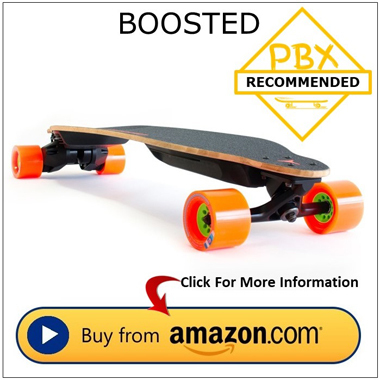 Now we can really only have one PBX Recommended product, and that goes to the Boosted board. However, the Koowheel comes a close 2nd place. It is packed with features that virtually no other board has. The value for specification is higher than any other board on the market. Technically, this board is a “no brainer” of a choice. However, there is a but! The build of this model is not as good as the specification. There are some issues that some users have had such as the deck not up to scratch, although I can’t see any issue with it unless if you are not using it properly. Some say it uses cheaper components, and that I can understand, but it’s not that this is not up to the job, because we think it is a nice board. Now the unit does have some lower cost components, and it’s not a patch on the Boosted model, but what do you expect for almost a third of the price! What this model does have is power and delivers an impressive 25 mph top speed. It’s goes like a rocket and the duration (distance) is equally impressive up to 25 miles on a full charge. The skateboard deck is made of 7-ply Canadian maple wood. This makes it strong and durable, but a bit heavy also. The battery, is lithium-ion and may be charged up to 1,500 times. It takes about 2 hours to charge, and on the underside of the board is a battery indicator where you can check the battery level. 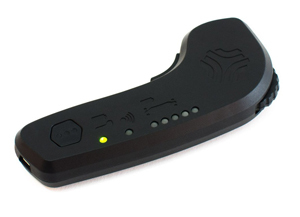 The remote that comes with the package operates at 2.4 GHz and is alsorechargeable, taking only 30 minutes to charge. The normal riding mode brings you to a speed of about 15 mph. However, the high speed mode will allow you to reach up to 25 mph or 40 km/hr. This is possible because of its dual brushless hub motor. 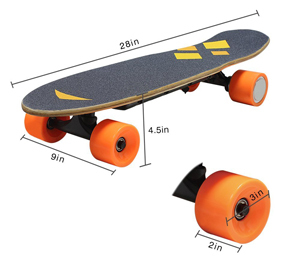 The dimensions of this skateboard are 920 x 240 x 130 mm. It weighs 16 pounds and can take a maximum load of 286 pounds, which is very good. This electric skateboard has quite a few safety features to it to avoid overheating. First, the deck itself is thick and temperature-controlled in order to contain the heat from the motor. When it reaches a certain temperature, the safety system cuts in and slightly reduces the speed of the motors to prevent overheating. This is a nice safety feature. We did notice that there have been some negative reviews around that have been from people not looking after their board. Many of these reviews are unfounded because they have complained about the unit not lasting, but they have not maintained and looked after it. Maintenance checks are important to carry out on any board including checking the wheels so that they still rotate freely, checking the bolts to make sure they are tight, oiling the bearings regularly etc. This will also ensure longevity of the unit. To keep your skateboard in top condition, you should always keep it in a dry and ventilated area. Moreover, it is important to keep it from damp environments as these can damage the PCB boards and battery. It is important to think of your electric longboard as a precision piece of engineering and treat it with respect, and then it will work well for you. 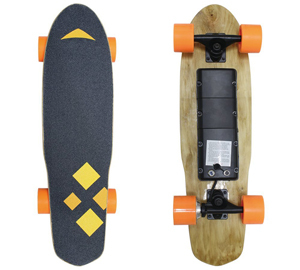 Material: The board is made of 7-ply Canadian maple wood and the battery is made of lithium ion. Remote: 2.4 GHz radio control with a charger. It has a dual brushless hub motor that can carry up to 130 kilos and run up to 40 km/hr. It comes with a 5500mAh battery. Net weight of 7.3 kgs and a size of 920 x 240 x 130 mm. It can carry a maximum weight of 130 kgs. Product warranty is 60 days. 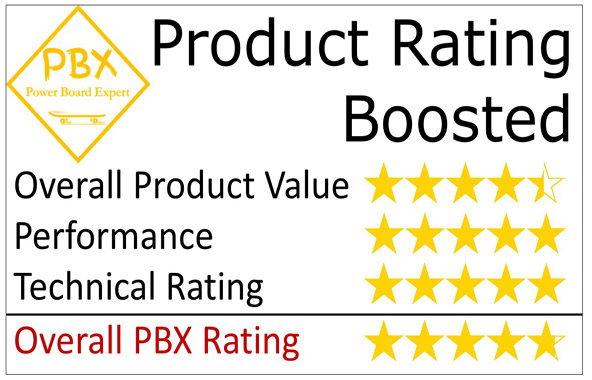 The is a great board and really receives our PBX Recommended award status. Don’t listen to the negative reviews, because what we have found is that many of them are due to people not looking after the boards as you are supposed to. This model provides high specification, and although they have tried to cut costs where they can, they have provided probably the best value board on the market. 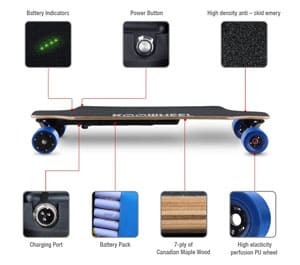 Haitralhave entered the market to cater for the best electric skateboard for the price. Now not everyone has $1400 to spend on a board, so the gap is open for a board that performs well but for a low price, and that is where the Haitral comes in to a class of it’s own. 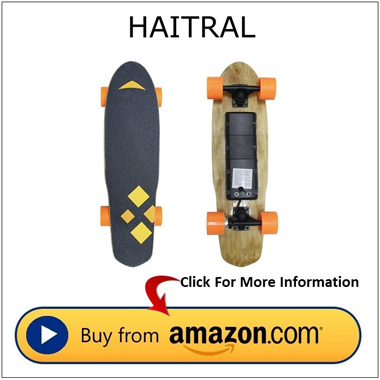 TheHaitral’s motorized electric skateboard is new on the market, and although it has only got limited reviews on Amazon, those it has are very good. 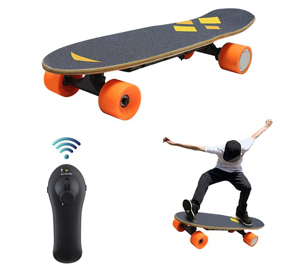 This model is easy to use; the handheld remote control that comes with the skateboard will make steering and riding a breeze. The deck is made of 9 layers of maple wood and the wheels are mode of polyurethane for best traction and performance. It weighs around 8.8 lbs or 4 kilos, and it is 28 inches long, 7 inches wide and 4.5 inches high. The wheels, measuring 3 inches in diameter and 2 inches thick, and are painted orange. The motor is a 150-Watt brushless hub motor, capable of reaching a maximum speed of 15.5 mph, or 25 km/hr. Now this speed is very impressive for the price you pay for the unit. If price is your mian concern, then this board Is a “no brainer”. 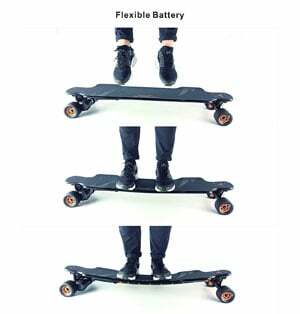 The battery of this skateboard will take about 2 hours to fully charge, and will be able to last for up to 1.5 hours. Directly after receiving the product, you should first charge the battery fully before using it. Doing so will ensure that you achieve a longer battery life. Otherwise, it might drain quickly during your next ride. Once the battery is fully charged, you will have to work on pairing the skateboard and the remote control. To do so, turn off the skateboard first and then press down the back and brake (the remote should also be turned off). While holding down the back and brake, turn the remote control on and continuously adjust the switch on the left side. You will start to notice a light coming off from the remote control. When this happens, you can now turn the skateboard on. Shifting the gears is not as straightforward, though. It is set on normal by default. To change it, you would need to adjust the brake in both directions, waiting until the board doesn’t make a sound. These are the instructions from the manual, and it is actually much more confusing than this, but in reality, you will soon get to grips with the process (like anything), and once you have, this board is amazing for the price, and provides top value for money. Another nice feature is that this unit is equipped with warning sounds to let you know if you are approaching the speed limit, your battery is running low, or when the battery is at high or low voltage. Probably the most impressive feature for this unit is its ability to cope with hill inclines of up to 35 degrees. Let me tell you that this is impressive regardless how much you pay for your board. Even the boards load is not bad, and rated at a maximum of 200 Lbs. The package includes an accelerator, a brake, a charger, and a wireless remote control. The remote control needs 2 AAA batteries, but these are not included in the package. The wheels have a diameter of 3 inches and a thickness of 2 inches. The motor is a 150-Watt brushless hub motor. It takes 2 hours to fully charge the battery. A fully-charged battery can last up to 1.5 hours. The maximum speed is 15.5 mph (25 km/hr). It can carry a maximum load of 200 lbs (90 kgs). The climb angle is 25-35 degrees. As far as electric skateboards go, Haitral’s motorized electric skateboard is pretty small and basic, but still delivers top specification for its price. 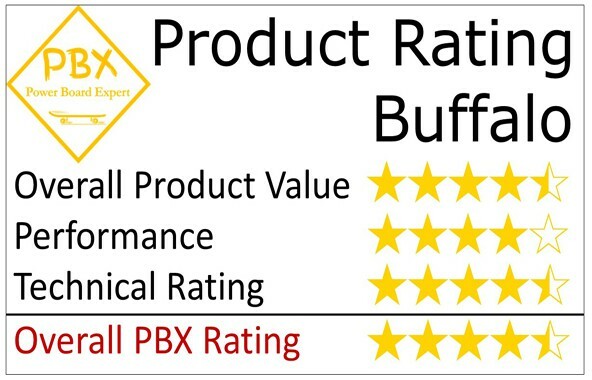 The value of this board makes it a PBX Recommended product. Now the dimensions are smaller than most electric boards and this means that it is easier to manoeuvre. The learning curve might be a bit bigger than other top market boards, but you can’t have everything right! With this model, you can choose between single and dual drive mode. The first allows you to travel up to 25 km, while the dual motor has a maximum range of 18 km. The motor power is 2400 Watts which is very powerful. This board has a maximum speed of 40 km/h!!! This is amazing, and if you are looking for a fast board at a reasonably low cost, then this unit ticks all the boxes. If you prefer a more relaxed ride, switch to cruise mode, which has a max speed of 20 km/h. And if you are just trying to learn how to use an electric skateboard, use the beginner mode that only has a max speed of 18 km/h. These features are very good and provides a good level of functionality for users across various experiences. The battery takes 3 hours to charge fully, while the remote control takes 2 hours. When it is not being used, it may store the power up to 1 month. The package comes with a charger and Bluetooth remote control, and a brake control. 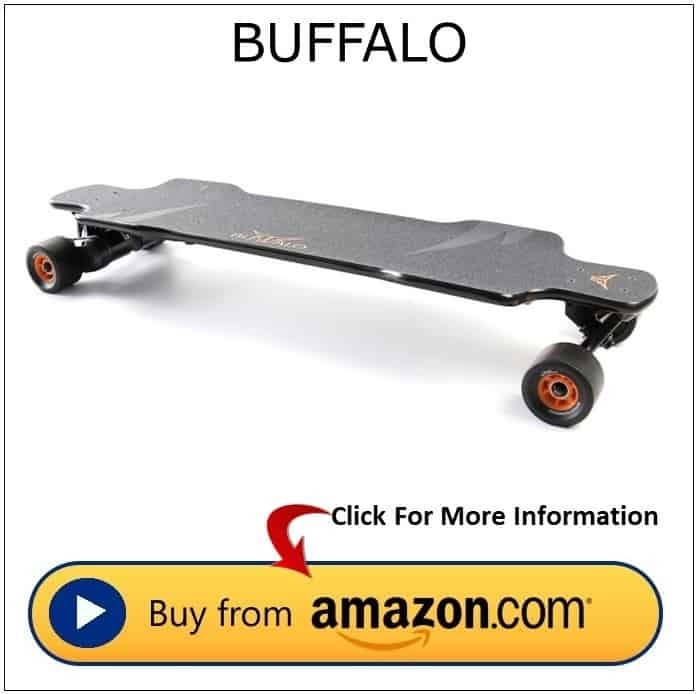 The Buffalo F’s package comes with a user manual and some tools that can help you assemble the skateboard. One thing I need to note are the brakes. They are very sensitive, and you will need to get used to them because they quickly bring you to an abrupt stop. The deck is made of 4 layers of bamboo and 4 layers of fiberglass and the tires are made of polyurethane. The package comes with a charger, a Bluetooth remote control, and a brake control. Dimensions: 38.4 x 9.4 x 5.5 inches (the deck has a length of 39 inches). The wheels measure 3.3 x 2.1 inches. It has a switchable single-dual drive mode (single motor: max 25 km and dual motor: max 18 km). The motor power is 2400 Watts. 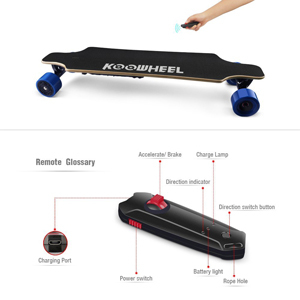 Skateboard battery’s charging time is 3 hours, remote control battery is 2 hours. Maximum speed is 40 km/h. The maximum load is 264 Lbs. The whole product has several certifications, namely, CE, ROHS, FCC, R&TTE, UN38.3, and MSDS. Can Far Can An Electric Skateboard Travel? It very much depends on the board and is dependant mostly on the rating of the motor. Generally speaking, they will travel between 10 – 25 miles per hour. Although this is a large range, you will need to look up the specification on each board. How fast Does AnElectric Skateboard Go? If you are looking for speed, the generally, you will have to pay more money. The reason for this is because the motor needs to be more powerful. Think of it like buying a car. If you want a high-performance car, you buy a Ferrari, or Porsche right, and these are costly vehicles. Same with the board, the high-powered motors that achieve best speed cost more money thank the basic standard boards. Generally speaking, the speeds range from 12 miles per hour up to 25 miles per hour. Now that might not sound like a lot, but remember, you are a few inches from the ground, and these speeds will appear fast, especially if you are one of the high performance boards where you can reach speeds of up to 25 miles per hour. These boards are exceptionally fast, and you need to be an experienced rider to cope with speeds of this level. When you have got used to the speed, you will doubtlessly be trying out more advanced techniques at speed. If you are adventurous therefore, and you can afford the extra cost, you should go for the more powerful unit, because speed is one thing, but a more powerful motor will enable better uphill climb and a more effortless ride. Can Self Electric Skateboards Climb Uphill? Do Electric Skateboards Catch Fire? Most boards have safety incorporated, and generally speaking, they don’t have the same issues that hoverboards had when they first came out. The answer to the question then is no, they don’t catch fire. What Are The Best Trainers To Wear On Skateboards? You can of course wear any footwear and it’s not a big deal. However, some boards travel at speed, and where safety matters, you should ideally invest in a good pair of trainers that have good grips and that are durable. Should You Wear Safety Gear? You should always put safety first. I would recommend safety equipment at all times. It’s not as cool as boarding without, but it could just save your life. Having a wipe out at 40Km per hour can be serious. Also, some boards brakes are vicious, and if you get thrown off at high speed, you might be glad of the safety kit. For other aspects of kit to wear, visit our Skateboard Fashion page.